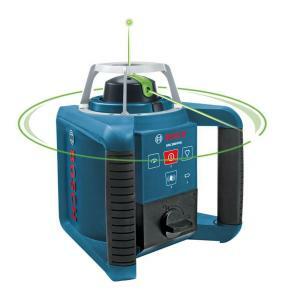 The Bosch GRL300HVG Self Leveling Green Rotating Laser features a 90° Plumb and Layout Beam. Bright Green Beam Laser For Better Visibility - 3x brighter than standard red beam. Full selection of beam visibility enhancements such as variable speed selection, variable scan angles for maximum visibility in all light conditions. Protected Cage for head assembly also provides access to quickly hand position the laser beam on a known point or work area. Electronic Self-Leveling in both Horizontal and vertical Position - With 90° layout beam for easy set-up and square layout. Full Selection of Beam Visibility Enhancements - such as variable speed selection, variable scan angles for maximum visibility in all light conditions. Tbook.com crawls the web to find the best prices and availability on Levels and related Tools and Hardware products like Bosch 1000 ft. Self-Leveling Green Beam Rotating Laser Level Kit (5-Piece). For this page, related items include products we find that match the following keywords: "Level" at our vendor partner Home Depot. Bosch 1000 ft. Self-Leveling Green Beam Rotating Laser Level Kit (5-Piece) is one of 154 Levels and related products listed in the Tools and Hardware section of Tbook.com If you have any questions on this product, please give us a call at 734-971-1210 during the hours of 9am - 5pm EST for assistance. Thank you for shopping at Tbook.com, the Internet Department Store!